In just three years, 1,040,000 gardens were registered with the Million Pollinator Garden Challenge (MPGC) involving an estimated eight million people, concentrated in the United States, and Canada with some in Mexico, and across the globe. From tiny yards to public gardens, the million plus gardens add up to a network of approximately five million acres of enhanced or new pollinator habitat. Drakaea thinniphila, a species of Australian hammer orchid. Photo © ron_n_beths pics / Flickr. The animal kingdom is full of strange, endearing, and even alarming courtship rituals and mating habits. Yet we don’t hear much about the bizarre reproductive strategies that plants use to produce the next generation. © Wendy Caldwell, Monarch Joint Venture. The eastern North American monarch population estimate for the winter of 2018-2019 reports a population size of 6.05 hectares, announced by World Wildlife Fund - Mexico and the Comisión Nacional de Áreas Naturales Protegidas (CONANP). This is the largest population we have seen since 2007, an increase of 144% compared to last year. 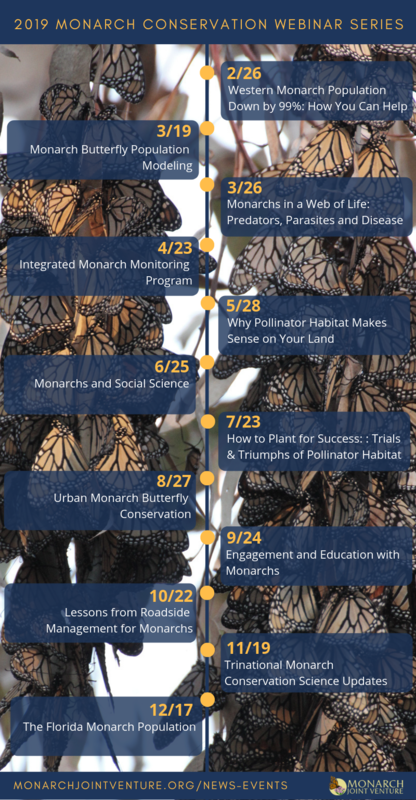 The Monarch Joint Venture is excited to announce the topics for the 2019 Monarch Conservation Webinar Series! The Monarch Joint Venture is partnering with the U.S. Fish and Wildlife Service National Conservation Training Center to put on another year full of informative and inspiring webinars on all things monarch. Find places to view wildflowers on your national forests and grasslands. Help us track monarchs and milkweed across the West! A variety of colorful and interesting articles, photos, and activities.